There are moments when I wish we still lived in times of old, only so that we could canonize great leaders with descriptors of their accomplishments. William the Conquerer and Richard the Lionheart would've been nicely complemented by say, Bill de Blasio the Groundhog Killer. Because that's what he is. When the history books remember the New York mayor, let them remember him not for his stance on universal pre-kindergarden, but rather for the fact that de Blasio dropped (thereby killing) a groundhog, ending Groundhog Day as we know it. Thanks, de Blasio. Much less impressive — and much more tragic — than dragon-slaying, de Blasio's accidental killing of the groundhog was a result of a bad case of butterfingers. On Feb. 2, de Blasio followed New York tradition, and held "Chuck" the groundhog to determine winter's fate. Unfortunately for the groundhog, it was not the end of winter that it foresaw, but rather its own demise. De Blasio dropped the animal, which subsequently fell six feet to the ground. At the time, it was reported that the groundhog was "recovered, uninjured, by his handler," but a short seven days after the incident, on February 9, the animal was found dead in its habitat at the Staten Island Zoo. A subsequent necropsy found that the groundhog's cause of death was "acute internal injuries" that were "consistent with a fall." The groundhog's fate was kept secret from both de Blasio and the nation, but on early Thursday morning, the New York Post broke the heart-wrenching news to the people. Dubbed a "cover-up," the Post alleges that "Staten Island Zoo officials went to great lengths to hide the death from the public." But that's not the only thing the zoo tried to keep private. Even more shockingly, the poor groundhog who died trying to predict the weather was not Chuck the Groundhog, who is always advertised as the reliable weatherman, but rather "Charlotte," a stand-in who was just trying to do her civic duty when she so unceremoniously took a tumble. Chuck was sidelined in 2009 after he decided to chomp on then-Mayor Bloomberg's hand. Charlotte, ironically, was chosen for the ceremony because she was the "least grouchy that day," as zoo spokesman Brian Morris told AP News. Of course, if Charlotte knew what she was in for, she probably would've been a lot less amicable. 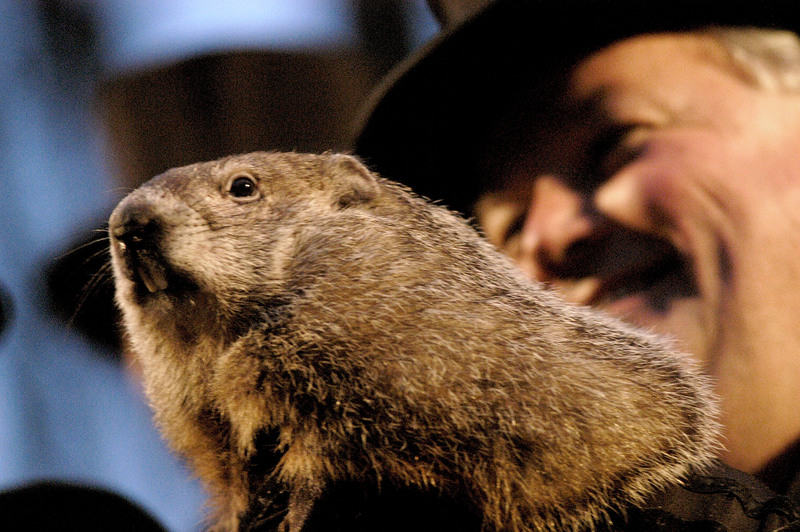 Early February tends to be "a time of year when genetics tell [groundhogs] to be hibernating," Morris added. "They can be in a bad mood." Note to groundhogs: always appear to be in a bad mood to avoid death by falling. Chuck's partialness for mayoral meat may have played another role in his partner's death — de Blasio was wearing thick yellow suede gloves while handling Charlotte as a protective measure, but while they may have kept his fingers safe, they certainly didn't allow him to get a solid grip on the groundhog. Let this be a lesson to groundhogs and humans alike — sometimes, your actions have much more far-reaching consequences than you could possibly imagine. So why the seven-month long delay in revealing poor Charlotte's death? The Post surmises that part of the secrecy may have been due in part to the large amounts of funding the zoo receives from the city. About half of the Staten Island Zoo's $3.5 million annual endowment comes from the the mayor's office, and as such, the Post reports that zoo officials "told the staff to keep the mayor’s office in the dark about the animal’s fate." This doesn't seem to make much sense though, seeing as the only thing worse than killing a beloved groundhog would be to pull funding from the organization that keeps the groundhogs alive in the first place. But however skewed the logic may have been, de Blasio and company were unaware that the animal had died until Thursday. There are 1,500 animals here [that] routinely die for a variety of reasons. We do not notify the public about every single death that comes up, we just don’t do it. But then again, not every animal's cause of death is "being dropped by the mayor of New York City." As a result of Charlotte's death, the zoo is now considering banning non-professional handlers from actually handling the groundhog. Morris told the Post that animal experts are examining "whether [the groundhog] should actually be physically transferred from one handler to another or if maybe [the groundhog] should just be displayed emerging or not emerging from his enclosure." After all, the zoo only keeps a family of four groundhogs around, and if mayors keep dropping them, we may soon be forced to turn to gophers instead. Gopher day, however, just doesn't sound right. And then the movie wouldn't make sense anymore. We don’t really do memorials or anything like that because we want them to show that Chuck is still around...It’s kind of like telling people that Santa Claus died, but don’t worry, we’re going to have another Santa Claus. RIP Charlotte. You're memorialized in my heart.